The Wall Covering and Vinyl Adhesive is an approved excellent solution for applying Wall Covering Wall Strips and vinyl corner guards. Each gallon covers 125 sq. feet with one coat. All.com�s Wall Guard and Vinyl Corner Guards. Does this adhesive stick to FRP ? I purchased the Johnsonite Vinyl Wall base product but need the contact bond. The website says I need the 945 Contact bond for the non-pourous surface. Is This product compatible to what is needed? 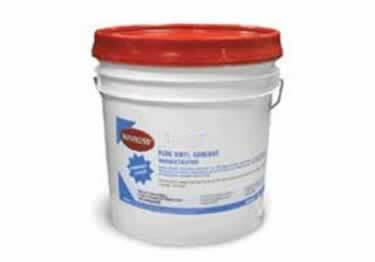 Is this product approved by Inpro as an acceptable adhesive for their .040 & .060 wall panels. They only show two products on there website for installation and this is not one of them. Thanks for the quick reponse in posting the MSDS, but it looks like the MSDS is from 2001. Is that correct? Also, do you have a technical data sheet? The data sheet would assist me in understanding all the basics for the product. Thanks. I would be interested in using this product, but I don't see a techncial data sheet or MSDS on your site. Can you send this infromation to my e-mail?